Last year I did a short post on using the Entropic Gaming System’s excellent Fear rules for Pathfinder (and technically for other, similar, d20 fantasy games). Here’s my attempt to expand it to 13th Age. The idea came from a good discussion at the Forge of the 13th Age Facebook group. As mentioned in my older post, those rules create a FEAR POOL that the Gamemaster can use to trigger all sort of cool effects. In 13th Age, each PC that fall below the Fear Threshold automatically add +1 point to the FEAR POOL (add +1 if the monster is double-strength/large, +2 if triple-strength/huge and +1 if it is an elite). If the monster is of a different tier than the party, please add +2 points. Finally - and that’s the catch - the Fear source (i.e. the scary monster) gains automatically +1 point to the FEAR POOL every time the Escalation Die goes up (yes, they’re that nasty). 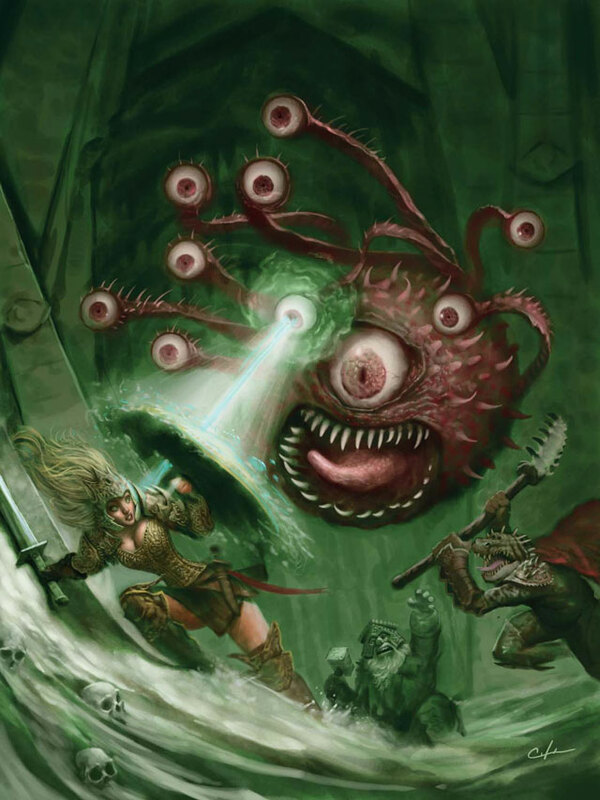 A beholder in 13th Age?! FLY YOU FOOLS! - inflict the Shocked condition on a PC (i.e. 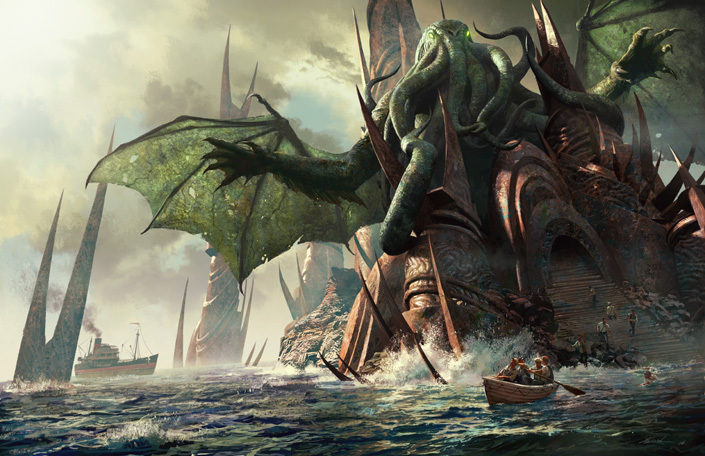 roll twice and pick the worst result, check the amazing 13th Age’s Bestiary 2). A PC can roll a save to remove this condition, but see below about “Facing your Fears”. - force a PC to go last in the round, or to go after the scary monster (Gamemaster’s choice). - weaken the PC’s resolve against the monster (treat all the PC’s attacks as if the Fear source had Resistance 21; if the Fear source has Resistance against the attack, roll it normally and if it is successful the PC deals only ¼ damage). - cancel a PC’s Rallying action (the PC still get his turn normally, but he must change his Rallying attempt to another action). - if a PC’s attack miss, spend 1 Fear point to automatically inflict normal impromptu damage against him (for example, if the Fear Source is an Adventure-tier monster, deal 2d6/3d6 damage). This damage reflects the PC’s desperation or the monster’s powers. - spend 3 Fear points to force the party to spend 1 Recovery for each PC. If they can’t spend that number of Recoveries, they must retreat and accept a Campaign Loss (OK, this is a Nastier Special). 13th Age is all about heroism, action and risk (and doing all that looking cool). But facing any creature that has Fear should be a tough call. When facing a Fear-inducing monster, the Escalation Die isn’t a gift. It must be earned. Every PC can declare that he’s “facing his fears”. If the PC wants the Escalation Die bonus he must roll a d6 at the beginning of his turn. If he rolls equal or above the current Escalation Die bonus, everything is fine. If he rolls below, the Fear source gains +1 point for the FEAR POOL (the PC can still use the ED’s bonus). Finally, any PC inflicted with the Shocked condition by the Fear source can try to get rid of it at the end of his round by rolling a save (11+ if the monster is of the same tier, 16+ if the monster if of a higher tier). If the PC fails his rolls, the monster gains +1 point to the FEAR POOL. Yup, these rules give a clear advantage to the monster and maybe are better suited to horror campaigns. But let’s give the party a bonus: if the monster is of a lower tier (i.e. an Adventurer-tier creature facing Champion-level PCs), than the Facing your Fears rules don’t apply. What?! 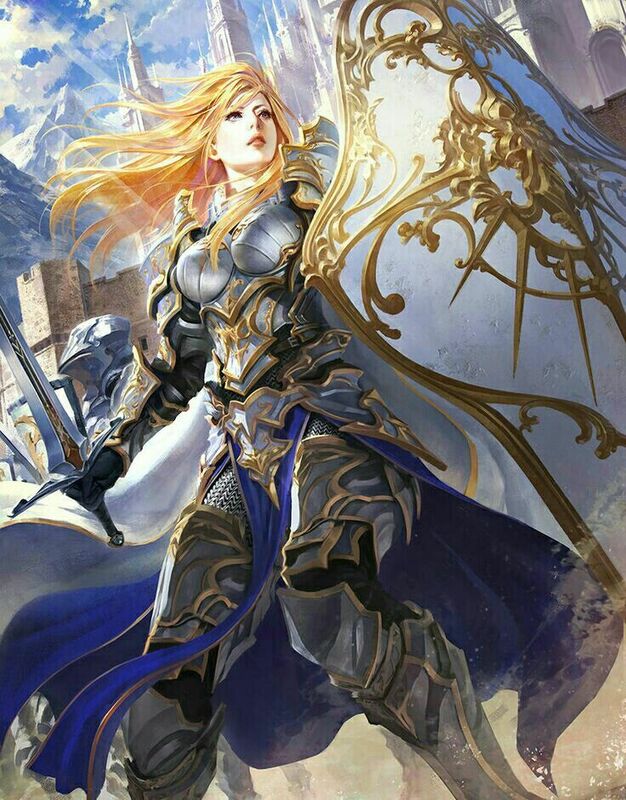 You have a Fearless Paladin in your party? Congratulations! The Paladin don’t count as a PC and don’t grant points to the FEAR POOL. Also, he can’t be affected by the FEAR POOL. Please, dear Gamemaster, concentrate fire on those holier-than-thou bastards. Enough with proselytizing about the awesomeness of 13th Age. Now, for those of you who don’t know 13th Age (are you mad?! ), I talk about it at this post and you can check their official page (and the Archmage SRD). 13th Age, in a nutshell, is an awesome toolkit of ideas for d20 (and non-d20) fantasy. For example, their Fear rules. Fear in 13th Age don’t make the PCs run away screaming in the night (which is cool in fiction or movies, but absurdly boring in RPGs). PCs affected by Fear in 13th Age can’t use the Escalation Die, which (again, in a nutshell), is a progressive bonus granted to the party during combats to simulate the action-driven heroism of that RPG. In other words, frightened PCs in 13th Age lose their edge and have a harder time facing monsters, which is a great way of simulating - mechanically - a Fear-effect (the dramatic part, including running away, can be perfectly roleplayed by the party, especially considering that 13th Age has other rules, like Campaign Loss, that work just fine for those horror encounters). The second aspect of 13th Age’s Fear rule is that it is triggered not by a failed save or attack, but when a PC falls before a certain HP threshold. The HP threshold is based on the monster’s level, which on 13th Age go up to 14th (that would be CR 20+ for most other d20 games I guess). When a PC drops below that mark, he’s instantly affected by Fear and can’t use the Escalation Die bonus on his attack rolls (until healed above the HP threshold). That’s a damn cool rule that could be adapted to other d20 games like Pathfinder, D&D and various retroclones. You just have to create a HP threshold. Because 13th Age’s PCs are really over-the-top heroes (Wizard or Rogue easily starts at 1st level with anything from 18 to 24 HPS), you have to adjust the threshold totals. In Pathfinder, for example, I would suggest the awesome (and unfortunately underused) Monster Statistics by CR table, available in every Bestiary. Just use half the table’s recommended Hit Points as a threshold. For example, a ½ CR critter usually has 10 hit points, so it provokes Fear when an PC has 5 or fewer hit points. What happen when you’re affected by Fear? Well, if you don’t want to use my FEAR POOL rules, the there’s a simpler solution: PCs below the Fear HP threshold suffer Disadvantage (i.e. roll twice any check and pick the worst). If you’re playing DCC RPG, instead of Disadvantage, inflict upon the PC a -1 Die penalty (i.e. instead of a d20 for attack rolls, he now rolls a d16). Cthulhu have stats! So it can be beated!